Once the new sofa is completed, our next project will be our kitchen and dining rooms. Since we recently put down new flooring (black & white checkerboard tiles), it will be our jumping off point. Beadboard will cover all of the walls, all painted in a soft linen color. Other than that, I am still searching for inspiration. This is what I have found so far. What do you think? Have any other ideas or websites that inspire a country cottage home? Please share! Gina, we are redoing our kitchen too. I've been scouring the internet for inspiration as well. And like you, beadboard is going to be used. I love the sink you found, I wish we could afford one like that. I love all your pics actually, I need to spend time on some of those sites you found them on. Thanks for sharing! My main problem is choosing a color. I love dark, rich colors, but have a dark kitchen with only one small window, so very little light. I cannot figure out what to do. That sounds lovely! Can't wait to see how your bed turns out--the sheets are pure inspiration! 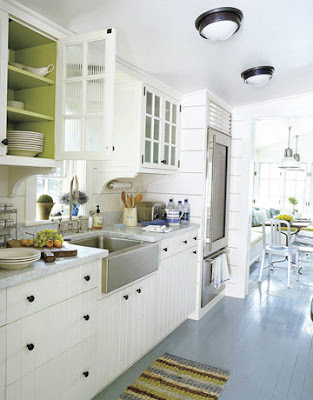 For a beautiful beadboard kitchen re-do (on a budget), check out One Woman's Cottage Life. There is a kitchen link on the sidebar there. 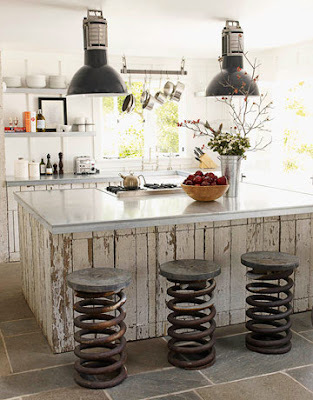 Those are some wicked funky stools at that kitchen counter! I know, my husband and I used to live on the Northern Neck in Virginia (they don't get much snow there) and we had got a light dusting there and everyone was running home to stay off the roads. Josh and I didn't think anything of it of course. I love the snow, but I am always tired of it and ready for spring by the end of winter. 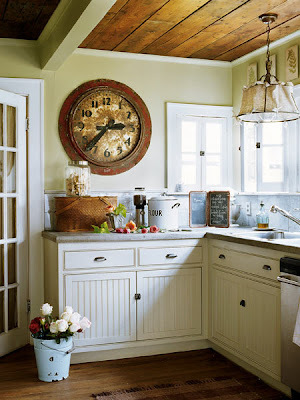 I LOVE the kitchen with the huge clock and the ragged cuboards in the last picture! Great ideas!! Those kitchens are all so light & bright - just beautiful. :) I can't wait to see how yours turns out ! PLENTY of inspiration in those photos! I think beadboard and a black and white floor would look spectacular with those touches! Good luck! Can't wait to see your redo. Ohh, lovely. I can't offer any advice because my house is a constant work in progess. We moved into wallpaper hell last April and I'm still trying to finish everything up. I will say, we added crown to our kitchen and it looks sooooo much better. I am a huge supporter of crown moulding. How pretty! Check out Heather Bullards's blog for her kitchen redo. I was very inspired. Love all of the photos...the last one not as much as the others but still...very nice. 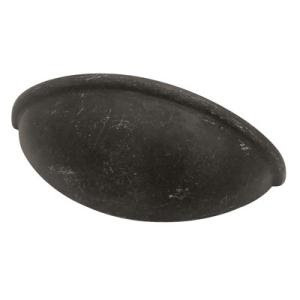 Have you checked out countryliving.com? They have a lot of ideas there. Those photos sure have a lot of good ideas! I'm seriously loving those white cabinets. Excellent taste Gina! Can I come over for a meal when it's done? LOL. Gina, You have chosen some wonderful inspiration pictures. I hope you'll share pictures of your work in progress. 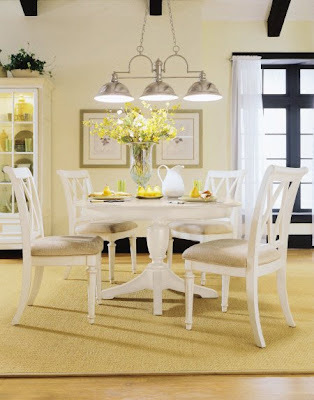 oh my look at those springy chairs!! 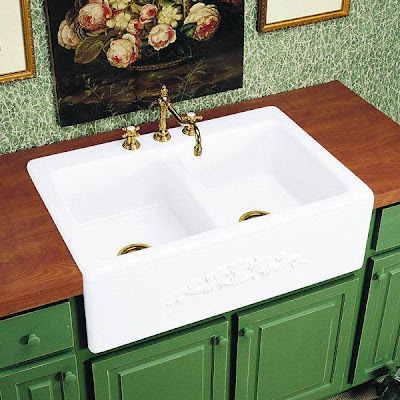 LOVE that sink....we redid our kitchen right after we bought this house and I would have LOVED to put an apron sink in! Beautiful photos. Good luck with the planning. I desperately need to do my kitchen over. Can't wait to see your progress! Hey Gina! I tagged you! I love those stools at the bar. Do they bounce?